Since God is omniscient and knows all things including the future, why would He create Satan knowing full well that he would rebel against Him and bring about the Fall of man? That question does not have a simple answer. I covered much of this in my article “How Thou Hast Fallen,” but perhaps this will answer some questions I did not address there. For my thoughts are not your thoughts, neither are your ways my ways, saith the LORD. For as the heavens are higher than the earth, so are my ways higher than your ways, and my thoughts than your thoughts” (Isaiah 55:8-9). One of the first things we need to understand about God is that He is omniscient; that is, His knowledge is absolute. God does not “learn;” He innately knows all that there is to know. That’s why evolution is such a stupid idea. First of all it attempts to explain all that there is as having come about by natural causes without God. Even many Christians try to compromise by suggesting that God used evolution to create. Why would God have to use evolution to create, as if He is some kind of mad scientist experimenting in order to get everything to work just right? No, God did not have to “think” about His creation; He knew exactly how to make all things perfectly without needing a blueprint. Not only that, but as expressed in Isaiah 46:10 above, He knows “the end from the beginning” and everything will be accomplished according to His pleasure. Everything God does is for His pleasure and for His glory. In context, in Isaiah 43:7, God is referring to His bringing back all the Israelites that have been scattered all over the earth to the land of Israel; but notice why He is doing it. It is because He has created them all for His “glory.” In a larger sense, that is true for all of God’s creation; it is all to bring Him glory. Now, if you have a good handle on that, we can talk about why God created Satan. When God created angels and humans, He gave them a free will so that they are able to choose for themselves whether they want to obey or disobey God. Humans, unlike the angels, were created in the “image of God,” and God gave humans dominion over all of His creation (Genesis 1:26). He did not give angels that kind of authority. In fact, of the angels, the Bible says, “Are they not all ministering spirits, sent forth to minister for them who shall be heirs of salvation?” (Hebrews 1:14). So God created humans superior to the angels even though, for now, angels have supernatural powers which humans do not possess. Back to Satan: God did not create Satan as “the evil one” in the beginning. How do we know this? We know this because at the end of creation, God declared everything – all of His creation including all the angels and Satan – as “very good” (Genesis 1:31). We cannot have a “very good” creation, if evil exists. So, at this point, Satan – his name is actually Lucifer (Isaiah 14:12) – had not yet sinned. By sin I mean that he had not yet rebelled against God. Sin is rebellion against God, and it manifests in many different forms, but the root is rebellion against God’s authority. 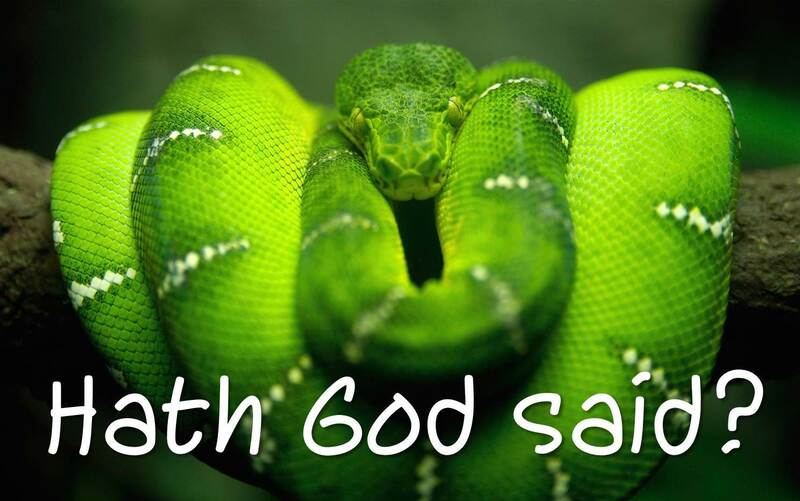 When Satan tempted Eve in the Garden, he told her “ye shall be as gods, knowing good and evil” (Genesis 3:5). We still deal with that same temptation. We want to be gods. We want to decide for ourselves what is good and what is evil, rather than let God be God. The Greek word translated as “lust” is epithumia and it means “a longing” or “desire” especially for something that is forbidden. “Conceived” is the Greek word sullambanō which means “to grasp” or “to seize.” So, it begins in the mind with a strong desire for something that is forbidden and once that desire is seized upon or acted upon, then there is sin, and then sin brings death. Death, in this case is speaking of “spiritual” death, i.e., separation from God. It happens this way for humans just as it happens for angels. So, what have we learned? Satan was good in the beginning. Shortly after the creation was complete, he rebelled and was sentenced to “death,” but the sentence has not been carried out yet. Satan still has access to the throne of God (Read Job 1-2). So, since God knows the end from the beginning, why did He allow this? As stated earlier, humans and angels have a free will to obey or disobey God. If God removed that option from us, if He removed our will to love Him or reject Him, there would be no love in that. The Bible says that “God is Love” (1 John 4:8). For love to be love, it cannot be coerced for forced. It must be given willingly of our own volition and choice. Without giving us that option, God could not enjoy the love returned from His creation. He had to allow for, not create, evil.